After the spore producing shoots the ‘leaves’ or tails appear. These will die off as autumn turns to winter and the roots sit there waiting for spring when they start the cycle again. 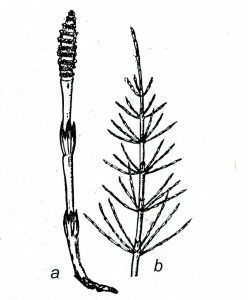 It’s critical to controlling horsetail to hoe off the initial stalks to prevent them distributing the spores. 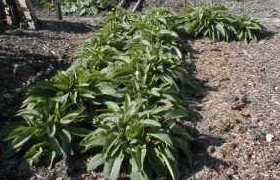 The leaves have a waxy coat, which makes the plant highly resistant to contact weedkillers like glyphosate which many people are concerned about using. However, I have recently found a weedkiller that is pretty effective against horsetail and marestail. Neudorff Superfast and Long Lasting Weedkiller. It is made from pelargonic acid which is found naturally in pelargoniums and maleic acid hydrazide. Maleic acid hydrazide has been around since 1895 and is well researched and understood. Since 1952 it has been used as a growth regulator on potatoes and onions to prevent sprouting. Crushing the leaves to break up the coating helps weedkiller to penetrate and become absorbed but in large areas it is not so easy to crush all the leaves . However, glyphosate weed killer will have an effect and eventually kill the plant. You will probably need 5 or more applications. Knock it back, it re-grows and you repeat. I don’t think you can clear this in less than one season with glyphosate if that. Another method is to thicken a mix of strong glyphosate with wallpaper paste or starch and paint it directly onto the fronds. Glyphosate used to be considered a very safe and environmentally friendly herbicide but recently a number or reports have been published that cast doubt on this and it may be best to look at alternatives. For best results treatment should be made to actively growing weeds between 1st March and 30th September. Kurtail works only when plants are actively growing. Kurtail will give effective control of horsetail through foliar (leaf) application. Best results are obtained by applying to approximately 20cm of heathy plant growth above ground. 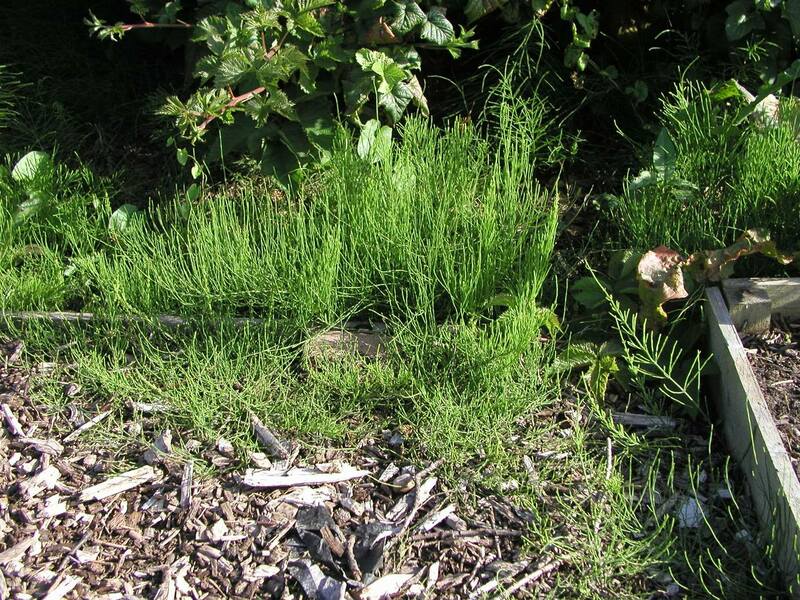 I’ve been contacted by Mr Charles Bailey who points out that Horsetail is correctly applied to the weed growing on land whereas Mare’s tail is correctly applied to the weed growing in water. Without resorting to chemicals you can control/eradicate horse tail by digging/forking through the soil when it is in the right condition: i.e. not too wet and sticky! Once you have removed as much as possible, any that shoots is easily dealt with. Before it reaches 3 ins/7cm high, hoe off an inch below the surface. It’s worth pointing out – and my thanks to Chris Donohue here – that horsetail is effectively one huge plant whose roots may be 100 metres in length and outside of the area accessible to cultivation. I’ve had reports praising how effective this is against horsetail or marestail. 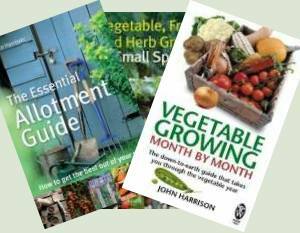 It is freely available to allotment holders and home gardeners. It is safe, children and pets are able to enter treated areas as soon as the spray has dried. Treated areas can be replanted after just 2 days. Full information on how it works can be found on Neudorff’s web site. Kurtail (previously Kibosh) which is glufosinate-ammonium will kill all grass and broadleaved weeds it contacts in approximately 7 days and provide effective control of annual and perennial weeds including thistles, couch grass and mare’s tail (or horse tail). Glufosinate is a natural compound isolated from two species of Streptomyces fungi. It inhibits the activity of an enzyme, glutamine synthetase, which is necessary for the production of glutamine and for ammonia detoxification. The application of glufosinate leads to reduced glutamine and increased ammonia levels in the plant tissues. This causes photosynthesis to stop and the plant dies within a few days Developed primarily for use with genetically modified resistant crops. Kurtail is professional use only – although it seems to be freely available on Ebay! Amcide is no longer available as a herbicide. However I have seen ammonium sulphamate for sale on Ebay as a compost accelerator (with dire warnings about not using it as a herbicide!) Just thought you’d like to know. Amcide (Ammonium Sulphamate) was an effective weedkiller used for killing tree stumps and brushwood clearing. In effect it is crooked sulphate of ammonia (a chemical nitrogen fertiliser). The plant absorbs it, taking it to the roots and dying. After 4 weeks or so, it reacts with the air to form sulphate of ammonia – adding a nitrogen boost to the soil. Re-planting is safe after 6 weeks. It may make the soil more acid – so check pH. Stinging Nettles – Problem or Resource?